No one wants to open the washer and see a load of laundry looking tie-dyed as a result of a sock, shirt or jeans that left dye all over the other clothes. So, how do you remove the dye stains from clothes? Whether you find that all of your white underwear is now pink (that rogue red sock) or your favorite striped sweater no longer has crisp lines, dye bleeding is always a headache. But the offending dye can almost always be removed from washable fabrics if you follow these steps. This dye removal process works on all white, colored, or print washable fabrics (do not use on silk, leather, or wool). Just remember to use oxygen-based bleach and not chlorine bleach which can cause more damage. Next, rewash all the stained clothes using a non-chlorine (oxygen-based) bleach (brand names are OxiClean, Nellie's All Natural Oxygen Brightener or OXO Brite) in addition to your regular laundry detergent. Follow the oxygen bleach package directions for how much to use for each load of laundry. These products are safe to use in both high-efficiency front load and top load washers as well as standard washers. Oxygen bleach is effective at any water temperature; however, if your water is very cold take the time to dissolve the oxygen bleach powder in a quart of very warm water before adding it to the washer. The rewashing with oxygen bleach must be done before the stained clothes are put in the dryer. The heat from the dryer will set the dye stains and make them much harder to remove. 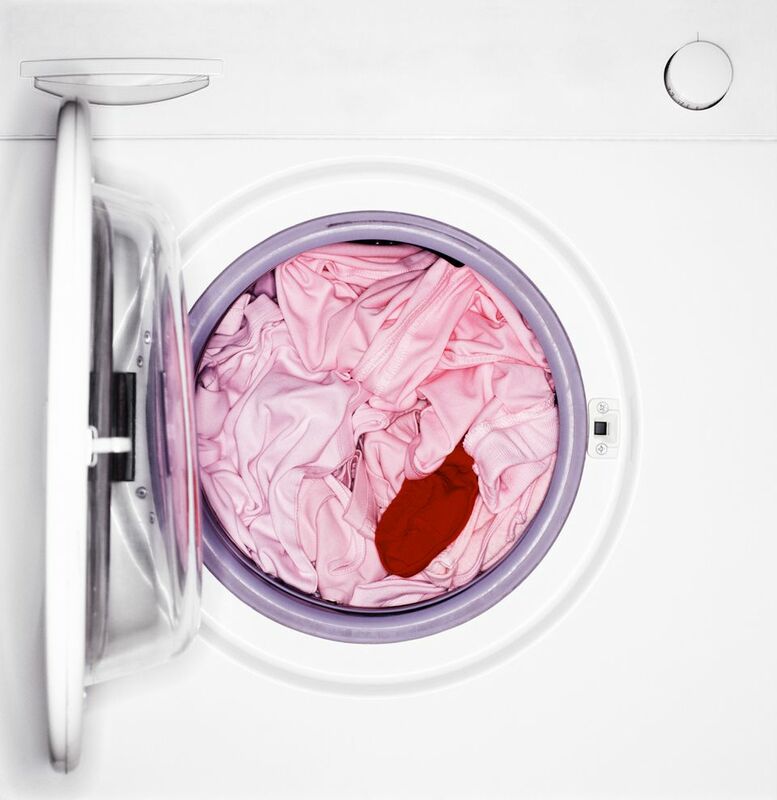 If the clothes were tossed in the dryer before you saw the dye stains or the dye transfer is heavy and rewashing doesn't work, you will need to slow down and set aside some time to soak the dye-stained items before rewashing. Go back to the oxygen-based bleach and cool water. You will have the best results if you use a powdered oxygen bleach formula rather than a liquid formula because the powder form is more stable than liquid formulas. You'll get more cleaning power for your efforts. Follow the package directions as to how much oxygen bleach to add per gallon of water. Mix the solution in your washer, a large non-metal tub (plastic storage containers work great), deep sink or bathtub. When the solution is ready, submerge the stained items and allow them to soak for at least eight hours. Check the clothes and if the dye stains are gone, wash as usual. If they remain, mix a fresh batch of the oxygen bleach and water solution and soak for another eight hours; then wash.
Patience will be a virtue. You may need to repeat the steps several times but this is the best way to get rid of the dye without damaging the fabrics. Can you prevent or stop color bleeding? Sometimes. Wash all new clothes with similar colors before wearing. This will remove some unstable dyes and will even prevent dye transfer from clothes to other surfaces (couch cushions, your favorite undies). If the garment is labeled as dry clean only, wet a cotton swab and rub it across an inside seam or hem. If you see color on the cotton swab, you'll have dye stain problems if you choose to wash the item. Handwash brightly colored items separately or in a load with similar clothing. Jeans bleeding blue dye onto other blue jeans won't do much harm. Use cold water when washing colored fabrics because it is more gentle on fabrics and will help the color last longer. There are loads of old wives' tales and internet hacks out there about how to set dyes and prevent color bleeding ranging from adding salt to vinegar to coffee to the washer water. In reality, these don't work on today's dyes and fabrics. Use a bit of caution instead when washing bright colors.